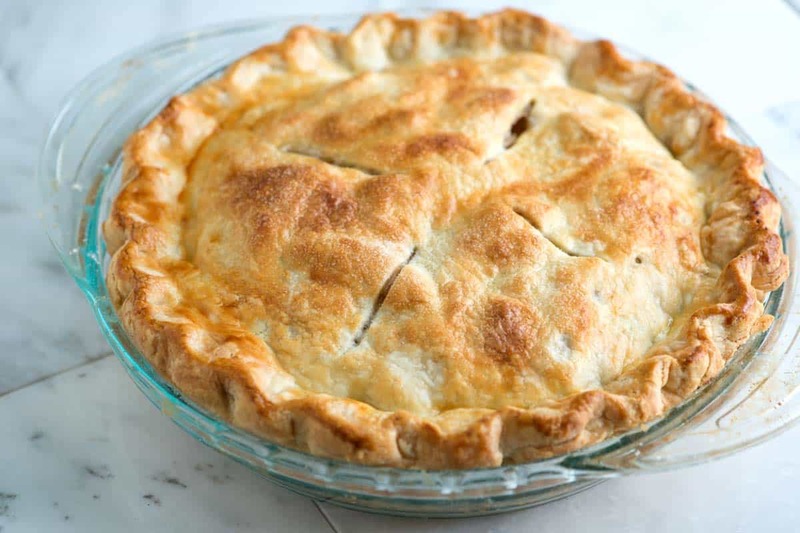 How to make cherry pie from scratch with a lightly sweetened filling of fresh (or frozen) cherries, vanilla, and almond extract. It’s to die for. 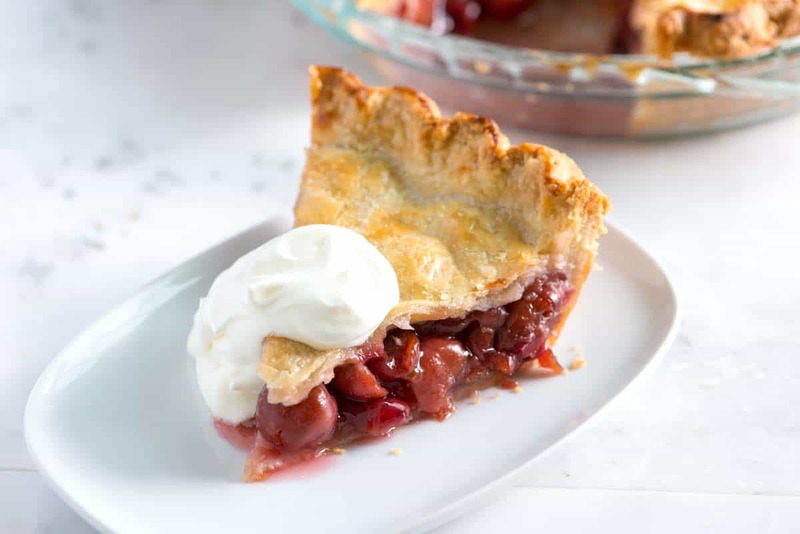 Jump to the Homemade Cherry Pie Recipe or watch our quick recipe video showing you how to make it. This cherry pie recipe is so easy — All you need to do is mix, fill and bake. The hardest part is pitting the cherries. For that, you might want to buy a cherry pitter or if you’re like us, cheat and use one of our suggestions below for how to pit cherries without a cherry pitter. Stir cherries with sugar, corn starch, lemon juice, vanilla and almond extracts then stir. Roll out a pie crust (or use store-bought), fill then top with another crust. Bake and cool. It’s that easy. To be honest, the hardest part is actually waiting for the pie to cool — you really want to wait 2 to 3 hours before cutting into the pie. We know — it’s torture! YOU MAY ALSO LIKE: Our Flaky Pie Crust Recipe and Video might be helpful. It’s an all-butter crust that’s ultra flaky. 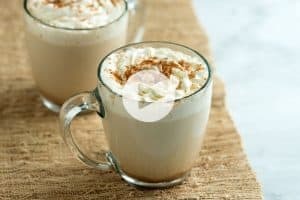 We even included a video to show you how to make it. As far as the cherries go, we like to use fresh cherries, but if you need to, use thawed frozen or canned/jarred cherries. (We share notes for both options in the recipe below). 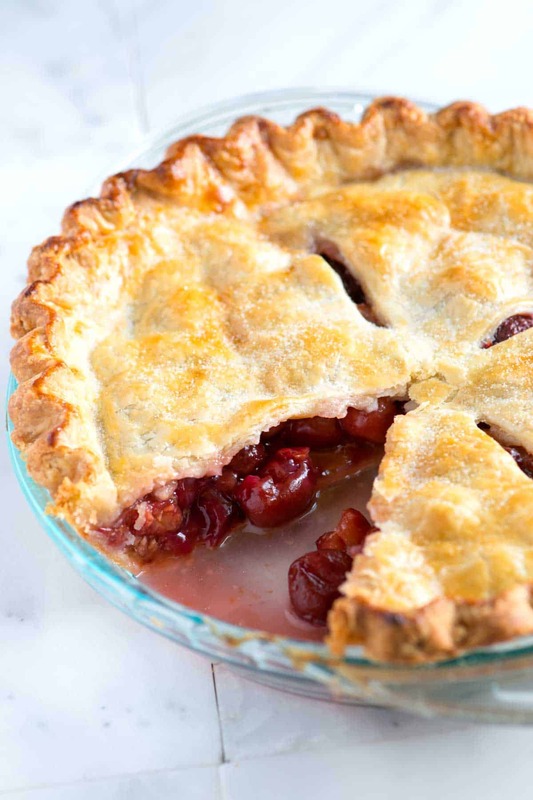 Both sweet and tart cherries will work well in this pie. We usually use sweet because fresh tart cherries are almost impossible to find where we live. No matter which you use, be sure to check for how sweet they are then adjust the sugar accordingly. We love serving each slice with freshly whipped cream, but ice cream would be divine. 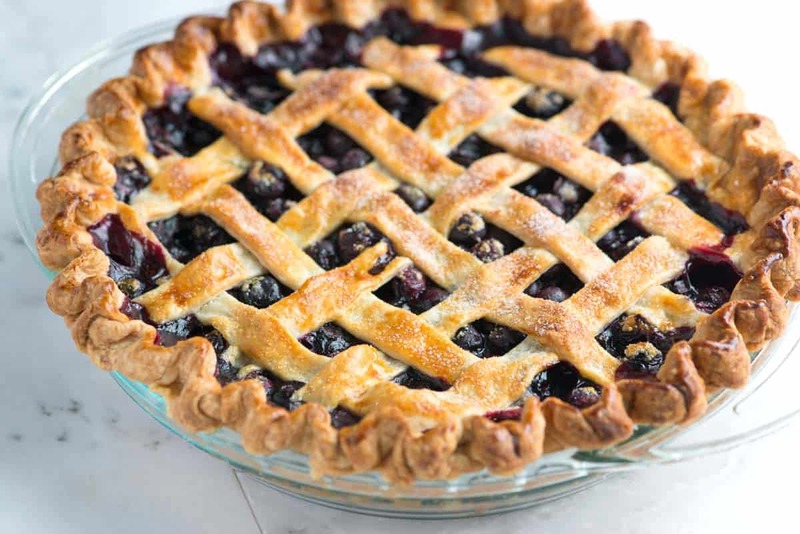 YOU MAY ALSO LIKE: This easy blueberry pie recipe with blueberries, warm spices, lemon and an easy lattice crust. Blueberries shine in this pie! Jump to the full Blueberry Pie Recipe. We have a small kitchen. That means that we only buy what we need on a weekly basis and while we would love to eat a slice of this cherry pie every night that just can’t happen. So, we don’t have a cherry pitter in the house. That didn’t stop us, though. We just looked around and figured out two ways to pit cherries without a cherry pitter. On the top, you’ll see we used a chopstick. We used the thicker round end to push the pit out of each cherry. The second option was to use a small piping tip. Place it onto the work surface then push the cherry down onto the tip — the pit pops right out. Of the two, we preferred using chopsticks. Both work, but the chopsticks were a little less messy. Making cherry pie is easy – all you need is a little patience when pitting the cherries. We promise it’s worth it. You can use sweet cherries, sour cherries or a combination of both, just remember to dial the sugar back or up depending on what you choose. 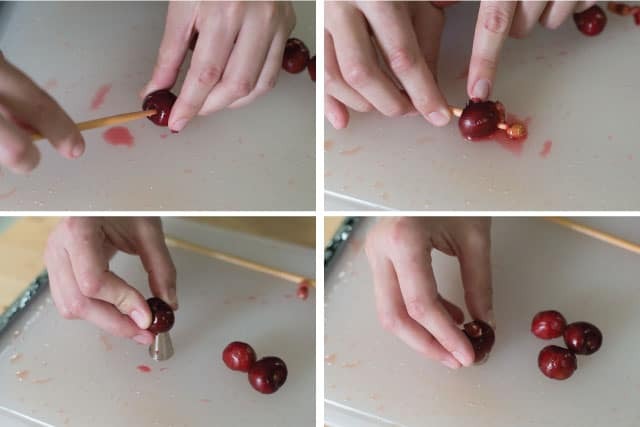 You can buy a cherry pitter, however, if you do not have one try using the thicker round end of a chopstick to push the pits out of the middle of each cherry. Another option is to push each cherry down onto a piping tip. 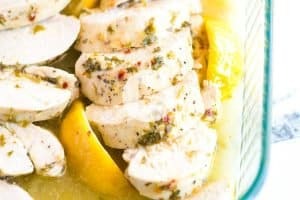 The sugar amount for this recipe varies depending on how sweet your cherries are. Add to your taste. We like to use fresh cherries for this, but you can use canned (see note below). In a large bowl, stir sugar, cornstarch, vanilla extract, almond extract, lemon juice and the salt together then add cherries. Gently toss to combine. Set aside. Remove half of dough from refrigerator and let sit at room temperature for 5 minutes. On a lightly floured surface, roll out dough to a 13-inch (1/8-inch thick) circle. (Occasionally, check if dough is sticking to the surface — add a small amount of flour when necessary). Check for size by inverting pie dish over dough round. Look for a 1-inch edge around the pie dish. Carefully press the dough into the dish. Spoon cherry pie filling into pie crust. Discard most of the liquid pooled at the bottom of the bowl. 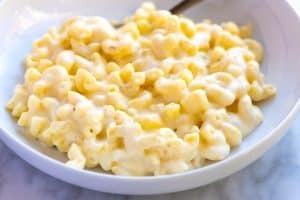 Dot filling with little squares of cold butter. Roll out second half of dough then top pie. Use a knife or pair of kitchen scissors to trim dough to within 3/4-inch of the edge of the dish. Fold edges of top crust underneath edges of bottom crust, pressing the edge to seal it so that it creates a thicker, 1/4-inch border that rests on the lip of the dish. Then, crimp edges by pressing the pointer finger of one hand against the edge of the dough from the inside of the dish while gently pressing with two knuckles of the other hand from the outside (see photo, we know that was wordy — you can see us do it in our pie crust recipe video, too). Refrigerate dough at least 20 minutes or freeze for 5 minutes before baking. Just before baking, make egg wash by whisking egg yolk and cream together in a small bowl. Use a pastry brush to brush over the top crust. Then, sprinkle with 1 tablespoon of sugar. Then, cut 3 to 4 slits in top of pie. 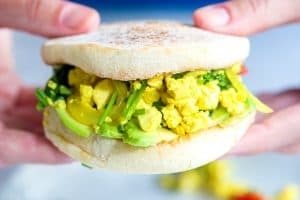 Bake for 20 minutes then reduce oven temperature to 350 degrees F and bake an additional 30 to 40 minutes longer, or until the crust is golden and the filling is thick and bubbling. Cool pie at least 2 hours, preferably 3, before cutting to allow filling to set. Note – It might be helpful to bake the pie on a baking sheet covered in aluminum foil so any juices that drip over the pie dish are caught. For canned cherries: Use 4 cups of canned or bottled cherries, drained with about 1/3 cup cherry juice reserved for adding to the cherry filling. For frozen cherries: Use 4 cups of thawed cherries, drained with about 1/3 cup cherry juice reserved for adding to the cherry filling. Love the crust recipe! Made this wonderful pie but added in some raspberries and boy, did I great comments from my friends! Great pie for Spring.